In 2015 BOB has released two new jogging strollers Revolution Flex and Revolution Pro that were an upgrade to the beloved Revolution SE. So I was a little surprised to see changes this year. I mean, why not wait till your product is ready instead of releasing it and then upgrading it a few months later? Anyways, the 2016 updates included: more upright seat, larger basket, better brake (still not flip-flop-friendly), higher weight limit of 75 lbs, redesigned frame, updated quick-release of the front and the rear wheels, and simpler recline. All these upgrades pushed the weight of the Pro to 30.5 lbs. Heavy! I am sure parents are pretty confused about the changes and the models. To make it easier for you, the Flex 2016 and Pro 2016 are almost identical except for the different colors, stroller weight, and the hand brake on the Pro model. That’s it! Everything else is the same. Both models also feature huge canopy, roomy seat, large basket, amazing suspension system, large air-filled tires, easy fold, and adjustable 5 point harness. The large basket underneath the seat is not the only storage. It also has two mesh pockets inside of the seat for your child to store his toys and a large mesh pocket in the back for parents to store their essentials. The seat can accommodate a child from 6 months and up to 75 lbs. If you want to use it from birth you can turn it into a travel system by purchasing a car seat adapter. It works with most popular car seats. Having hard time deciding between Pro and Flex models? If you think you will be going off road and running up and down the hills a lot, then you should get a Pro model. The attached hand brake will give you ability to slow down quickly. If you prefer jogging in the park at an even pace, then I would get a Flex model to avoid having a hand brake getting in the way. Just like Flex, the Pro model got 5 out of 5 stars from me despite the increased weight because it’s simply the best jogging stroller on today’s market. One of the things I would change would be adding an automatic lock and a standing fold. Other than that it’s an AMAZING stroller. You can get it on Amazon for around $550 (free shipping/free returns and no sales tax). -Huge canopy. The canopy is a great size. It goes down all the way to the where the bumper bar would be providing plenty of shade. The large peekaboo window is made out of clear plastic and comes with a Velcro closure. Of course I would like to see a magnetic closure instead. -Adjustable handle bar. Just like the Flex model, Pro has an adjustable handle bar with 9 different positions. It goes from 34″ all the way up to 48″ from the ground. Great for shorter and taller parents. -Hand brake. The hand activated rear drum brakes are great for when you are jogging down the hills & inclines. This is why the Pro model weighs 2 lbs more than the Flex. -Runaway strap. It has a runaway strap attached to the handle bar that you can use as an extra security to prevent your stroller from running away from you. This strap doubles as a lock when stroller is folded. Yep, there is no automatic lock. -Roomy seat. The seat is very roomy and can accommodate a child from 6 months and up to 70 lbs. What I really like on ALL of the Revolution models is how durable and well padded the seat is. It’s made out of high quality material with water repellent coating which makes it very easy to clean. On BOB’s site it says that you can put a child into the seat starting at 8 weeks. 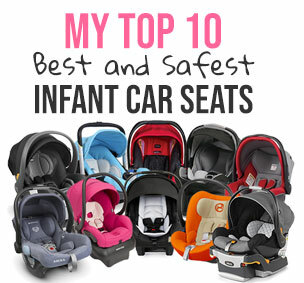 I would recommend using an infant car seat till your baby is 6 months old because the seat will not provide needed support for a baby. Or, you can put your child right into the seat with an infant insert. For 2016 the recline has been updated. Now it’s an one-hand recline system instead of two hand-recline in 2015 model. You will still need both hands to bring the seat back up, but it’s a huge improvement from the previous model. Another great update for 2016 is a more upright seat in the most upright position. Now your child has more support to sit up straight and look around. -5 point harness. It has an adjustable padded 5 point harness with a center release buckle. I really like how thick and padded the shoulder straps are. -Large basket. The basket just got 15% larger! It also sits a little lower so you can fit a lot more stuff in it. BTW, you can easily access your stuff from the sides or the back. -Additional storage. There is a lot of storage on Pro 2016 model. There is a large mesh pocket in the back of the seat where parents can store their essentials and two mesh pockets inside of the seat where your child can store his stuff. My daughter likes to keep her sippy cup in one of the pockets. -Large wheels. When it comes to Pro, it’s all about the wheels! It rolls on large air filled high-impact polymer composite wheels with pneumatic tires that can handle ANY terrain while providing your child with a VERY smooth ride. The rear wheels are 16″ while the font wheel is 12.5″. The front wheel is swivel with the ability to lock straight. For 2016 they updated the quick-release function of the tires. It’s still very easy, but is safer. -Adjustable suspension system. The state-of-the-art suspension system adjusts to two positions depending on the weight of your little passenger and the terrain. I’ve tested a lot of joggers and BOB Revolution has the BEST suspension system hands down. -Parking brake. The parking brake has been updated and is now a little more flip-flop-friendlier, but not quite there yet. LOL. I hope it gets there after the next upgrade. It used to be red color, but now it’s grey. -Easy fold. It’s not an one-hand fold, but is east to do. Unfortunately, it does not have an automatic lock and there is no standing fold. To lock the stroller after folding, you need to put it on the ground and use a strap with a clip attached to the handle bar. Bending down to the ground to lock it is very annoying. Especially if you like me have a back pain. As with any jogger this package is very bulky. The folded dimensions are 39″L x 25.5″W x 16″H. -Bulky. Like most joggers the Pro is bulky. You can remove the rear wheels to make it more compact. -Heavy. The SE model wasn’t heavy at 25 lbs which is an average weight for a jogger. With all the 2016 upgrades Pro weighs now 30.5 lbs which is heavy! -No automatic lock. You will need to bend down to the ground and use an attached strap with a clip to lock it manually. –No bumper bar. I wish there was a bumper bar available for purchase. On the bright side, you can get a snack tray that your child can use as a bumper bar. Here is an overview of the Revolution Flex 2016 which is almost identical to the Pro 2016 model. Here is a comparison video of Flex vs Pro by BabyGizmo. Higher weight of 30.5 lbs. All these great updated increased the weight of the stroller form 28.5 lbs to 30.5 lbs. It comes in 2 colors: green and black. My favorite place to buy strollers and a lot of other baby items is Amazon. It usually has the lowest prices, free shipping, free returns and no sales tax. How great is that? You can get BOB Revolution Pro model in one of the three beautiful colors for around $550 on Amazon (free shipping/free returns and no sales tax).